It’s always good to know how best to pair your food with a beer. For Indian food, a Lager is a safe option. In this article, we will explore the basics of food and craft beer pairing. The three basic rules are ‘Complement, Contrast and Cleanse’. Contrast : a contrast in flavours works really well. For example if you pair a Hefeweizen’s sweetness with a spicy dish. Cleanse: Beer with high carbonation and gravity will help cleans your palate. 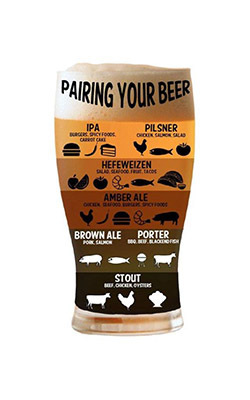 Using these basics, below is a brief pairing guide for some craft beers. Brown Ales/ Amber/ Reds : These brews pair well with nutty and roasted dishes including burgers, steaks, grills and smoked foods. These brews pair well with salads, shellfish, sushi, grilled chicken and pork. They also pair well with pasta dishes that are not too creamy or filled with meat sauce. Pairs well with roasted and smoked foods. These include BBQ and grilled food.